Description: In a seedy river town on the Gulf of Honduras, Jack Rathbone believed he had found a place that would give him and his lover, the accomplished artist Vera Savage, the solitude they would need to create a body of work that would shake the art world to its core. But in a place where time lies thicker than the mangrove swamps that surround it, Jack and Vera discover an emotional frontier more fearsome, untamed, and dangerous than any wilderness.Told through the voice of Jack’s adoring sister, Gin, Port Mungo is the riveting story of this ill-fated couple, one that begins as a bohemian flight-of-fancy before unraveling into a dark, debauched and sinister tale. 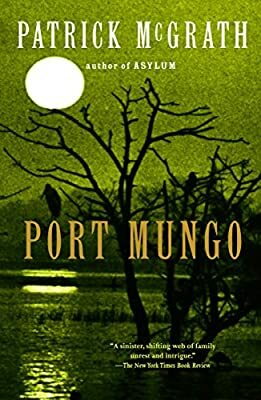 With Port Mungo, the incomparable Patrick McGrath, author of the acclaimed novels Spider and Asylum, delivers a spellbinding narrative to explore the obsessive pursuit of art and love.